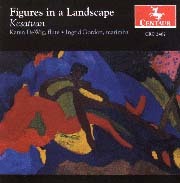 A landmark recording of major works for flute and marimba. Reprinted by permission of the Percussive Arts Society. Click on the composer's name to go to their website, or the title of the piece to hear an excerpt (mp3 format). This project was funded by the Regional Arts and Culture Council in Portland, Oregon, the Yvar Mikhashoff Trust for New Music, and by generous contributions from Robert Morris, Timothy Melbinger, Randy Zasloff, Logan McDougal, Alex and Joan Murray, Joan Dawson, Anne Marie Morosin, Alex Granok and Niel DePonte. Thank you, donors! The CD was recorded in Portland. Oregon at Lewis & Clark University's Evans Auditorium between June 8-11, 1999, and edited at Superdigital, Inc., in Portland, Oregon in July of 1999.